We’re most likely going to Mon Chéri again. The vote will be open until the end of the week. I might be able to go on Feb. 23. at 14:00 (I actually prefer it instead of 18:00) but I have to work that day and don’t know whether I’ll finish until the pen meet starts. So I guess Feb. 23 at 14:00 has my vote as well I just hope I can make it. By the way, can’t we edit votes? I just tried it, you can edit your votes. I closed the poll, our next meet will be this Saturday, Feb. 23rd, starting 14:00, at Mon Chéri. I can’t go tomorrow to the pen meet. I got sick yesterday. Jobbulást! I am also unsure, the cold got me since days. Lets see. Get better, both of you! But I hope @Muszga you’ll be able to still come. Also, I’ll be at Pirex (Ferenciek tere) from 1 pm to test the Lamy inks (and waste time XD) so if any of you arrive earlier than 2 pm you can find me there or at the cafe before the meeting start. If any of you want some company. Amúgy köszi. tényleg, azért érezzétek jól magatokat! A lamy tintákból megvettem a Topazt, ami egy szép barna szín. 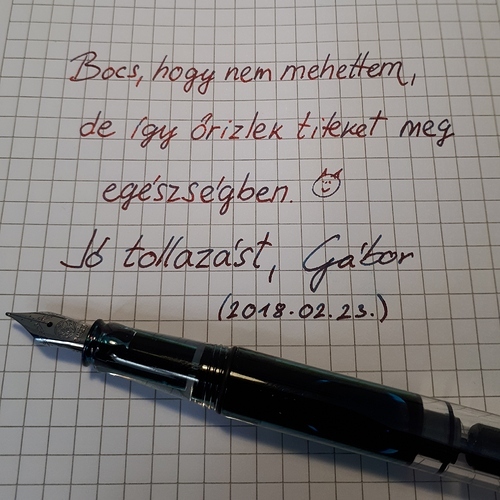 Topaz tényleg szép és ha jól látom, még ha enyhébben is, de ugyan olyan zöld sheenje van, mint a Krishna Vaikharinak.